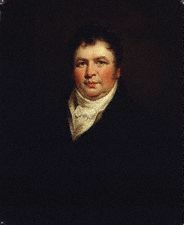 Born 1767 in Leicester; the son of a Farmer, or perhaps in London; the son of a Brewer, Richard Phillips, despite having been imprisoned for distributing copies of Thomas Paines, ‘Rights of Man’ became Sherriff of London in 1807 and was knighted for his achievements in office. For he loved them for gain to serve his ends. Declared bankrupt, Phillips somehow avoided the debtor’s prison and also managed to keep control of many of his business interests. Even after his death, his influence worked in odd ways; initially buried to the north of the church, when this area was cleared in the 1850’s for the church redevelopment most monuments disappeared without trace – corpses headstones and all thrown down a disused well nearby. Phillips was accorded a different fate, being disinterred from the churchyard and reburied with his tomb rebuilt in a prime location at the entrance to the Garden of Rest, some years after burial had been prohibited at the site by statute. A lifelong vegetarian, an ardent prison reformer and an educationalist Phillips is now best remembered for his ‘interrogative’ system of education. Also he claimed to have disproved Newton’s Theory of Gravity and to have purchased the skull of Cardinal Wolsey for a shilling. Here rest the remains of Sir RICHARD PHILLIPS, Knt., Born December 13, 1767, Died April 27, 1840 and lived through an age of memorable events and changes and was an active and anxious contemporary. He was Sheriff of London and Middlesex in 1807 – 8 and an effective ameliater of a stern and uncharitable criminal code, he was in 1789 the inventor and promulgator of the Interrogative system of education by which new impulses were given to the intelligence of society. He also placed natural philosophy on the basis of common sense and developed the laws of nature on immutable principles which will always be co-extensive with the respect of mankind and for truth in the promotion of these objects and a multitude of others. He wrote and published more original works than any of his contemporaries and in all of them advocated Civil Liberty, General —– ascendancy of justice and the improvement of the Human Race. As a husband, father and friend he was also an example for imitation leaving a mourning family little to inherit besides this good name he died in the enjoyment of that peace which the sweet truth of the Christian Religion and the world can never give nor take away. This entry was posted in Author, Dignitary, Rest Garden, St Nicholas. Bookmark the permalink.